I had taught a one-week information technology course in Hong Kong, and then headed inland on a train. Frequent trains join Hong Kong and Guangzhou. 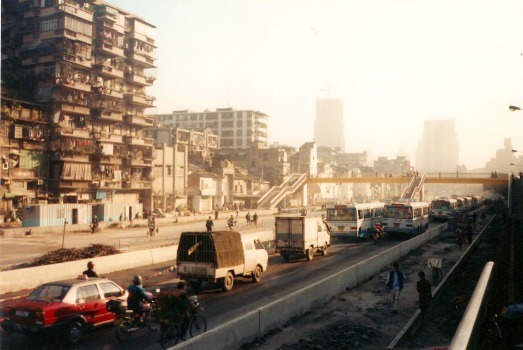 On my first trip to Hong Kong and inland, I stayed in Guangzhou for a couple of days before I had to head back to the U.S. I was staying in the hostel on Shamian Island in the Pearl River, the only place independent budget travelers could easily stay at the time. I looked around Shamian Island at first, then went to the large Qingping Market and visited several street markets. The hostel on Shamian Island is a nice place to stay, certainly low priced, in a pleasant location, and there's a Metro station close by. 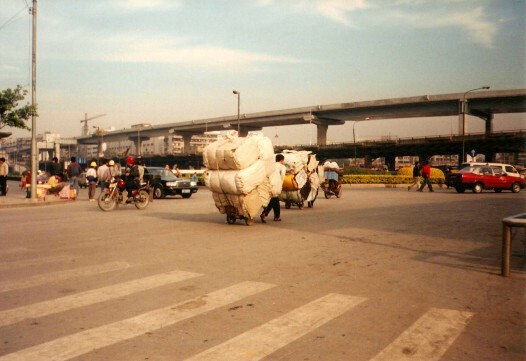 The next day I crossed over the highway and wandered through the Qingping Market. It's about like a Middle Eastern food market, minus the halal constraints on species of animal and cleanliness of preparation and handling. 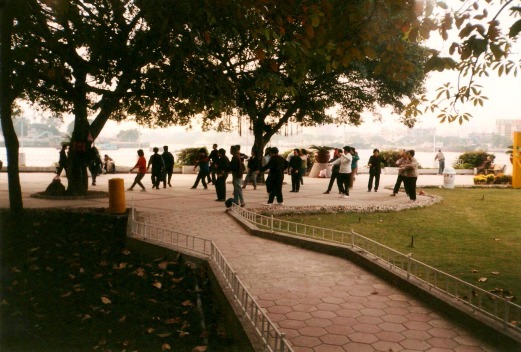 A large group gathers in the park by the river to do Tai Chi exercises every morning. 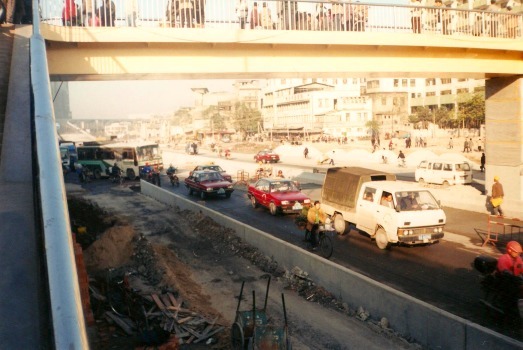 On the way to the Qingping Market. The stalls offered turtles pressed flat, dried coiled snakes, and all sorts of sea creatures. Given the state of the local water, "freshwater" seafood is probably a bad idea. Some stands even offered piles of large beetles. Make-your-own lacquer? Or for food? It's said that "The Guangdongese will eat anything with legs except a table", and the Qingping Market provides the proof. 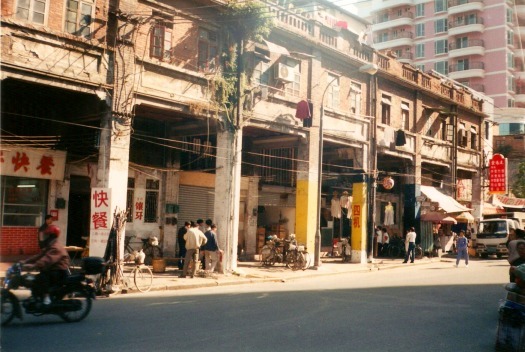 I wandered randomly through the neighborhoods to the north of the Qingping Market. I came to a shop preparing and selling a sort of fry bread containing onions — the ingredients looked pretty clean and it was definitely being cooked at high temperature, so I got one. 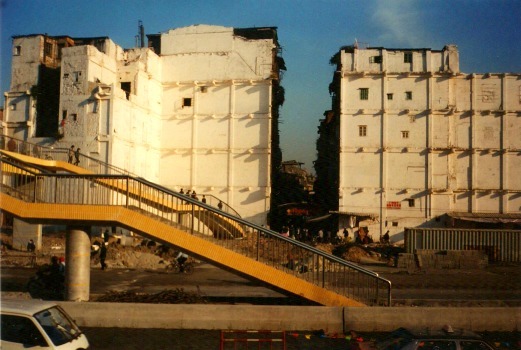 The Beijing government has destroyed most of the temples, but a very few survive in Guangzhou. They offer a glimpse of what must have existed in China before all religions except worship of the state were outlawed. I made my way to the Bright Filial Piety Temple, well worth a long visit. 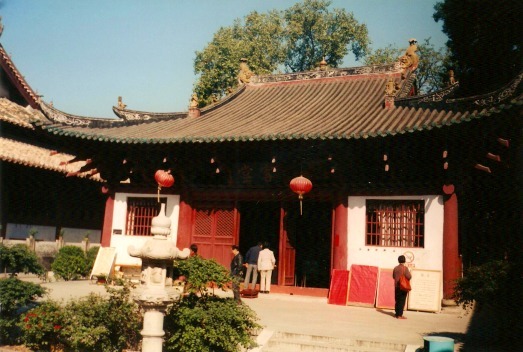 光孝寺 or Guāngxiào Sí, Guangxiao Temple, is also known as the Temple of Bright Filial Piety. 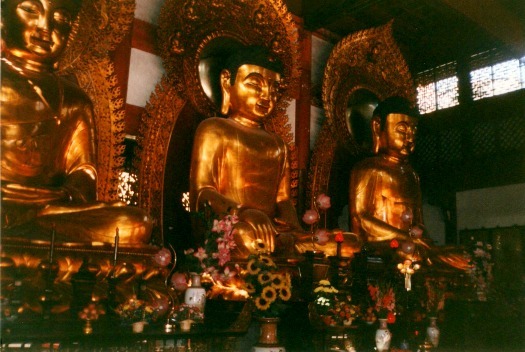 There are several shrines inside, each holding large gold-painted statues. An Indian monk built a temple here during the Eastern Jin Dynasty of 317-420 AD. 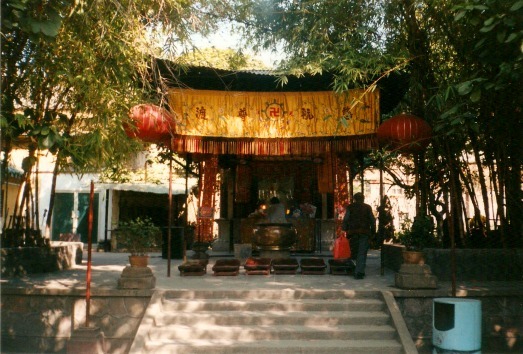 Huineng of the Zen Buddhist sect was a novice monk here during the 7th century. He became one of the most important figures in Zen Buddhism, and has traditionally been viewed as the Sixth and Last Patriarch of the movement. 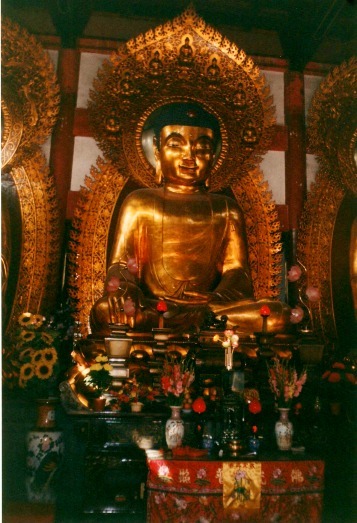 The Platform Sūtra is attributed to him, it explains a wide range of Buddhist scriptures including the Diamond Sūtra, Lotus Sūtra, and others. 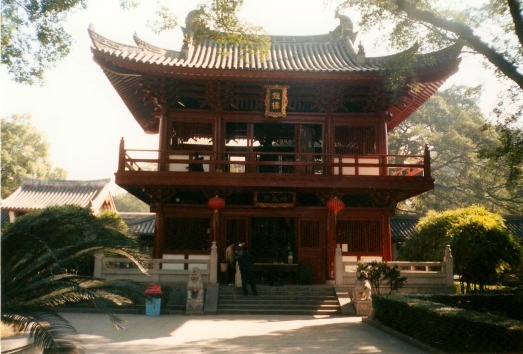 The current temple was built during the Qinq Dynasty, which was established in 1644. 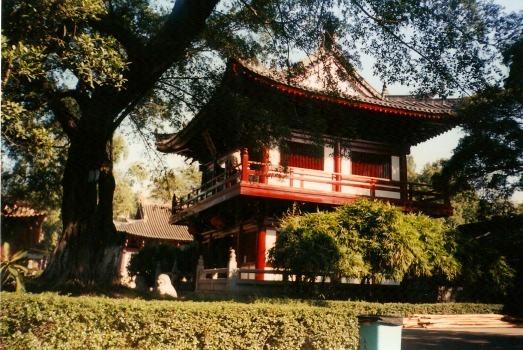 Huineng's hair is buried in the small pagoda within the temple. Worshipers get a bundle of joss sticks — incense — and light three at a nearby candle. They put the lighted sticks in a large stone or bronze pot filled with sand. A series of bows there, possibly also on some upholstered kneelers near the rail or altar. 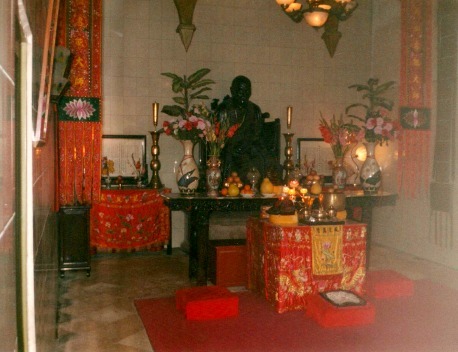 Shrine at the Bright Filial Piety Temple. A smaller shrine at the Bright Filial Piety Temple. Some visitors leave food, usually some peanuts or oranges "for the enjoyment of the god," really for the nourishment of the few monks. Each shrine is staffed by an attendant who periodically collects the food. A fair number of people were there worshiping, it seemed, but this is one of maybe only three major temples in a city of millions. What little religion is allowed in China is strictly limited. The altar of a smaller shrine. From there it's not too far to the Buddhist Temple of the Six Banyan Trees, ​​​​​六榕寺​​​​​ or Liùróng Sì. It was built in 537. 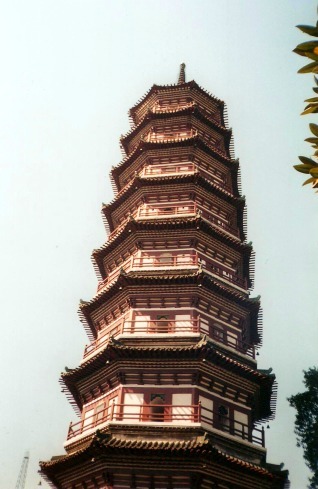 The large pagoda, its main structure, was first built in 1097. It burned, and was rebuilt in 1373. There were worshipers here, but also many western tourists. Shrine at the Temple of the Six Banyan Trees. Large shrine at the Temple of the Six Banyan Trees. Tall pagoda at the Temple of the Six Banyan Trees. 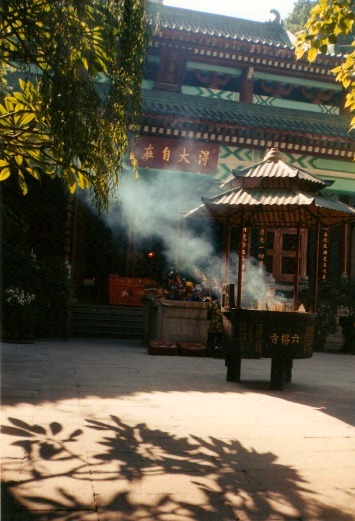 Incense burner at the Temple of the Six Banyan Trees. I got lunch at the Caigenxiang vegetarian restaurant at 167 Zhongshan Lu. After the morning with the Buddhists, and particularly after the walk through the Qingping market, that seemed best. 5Y gets a big plate with rice and some selections of vegetable and mushroom dishes selected by pointing. Tomb of the Martyrs of Guangzhou Commune W.C.
That's a lot of condensed blood pavilions. The decadent sounding "yachts" were some battered and faded paddle boats in a series of decorative ponds. A Chinese analogy to Uncle Josef Stalin with his Matrix-style long coat flowing in the CGI breeze. As a general trend in China, there is an amazing amount of hacking and spitting. I had read of it in advance — Paul Theroux's book Riding the Iron Rooster discusses it in several places, and mentioned that at the time it was written, China was the only country producing spittoons, steam locomotives, corrugated washboards, and quill pens, products unused in the rest of the world for decades. There is so much continuous loud hacking and spitting that it gets funny at times. Walking through the Qingping Market, I saw one guy standing in the middle of the passageway bent over and blowing his nose with his fingers, a two-foot long rope of mucus hanging from his nose. Little old ladies sound like they're hacking up a lung, then spit out a huge gob wherever they're standing or walking. China is way behind other countries in many ways. Human rights, most obviously. Also hygiene — Egypt is far cleaner. The hygiene problems have many components — mucus and saliva from all the spitting; raw sewage in the water and garbage everywhere; and filthy air. There are thousands of people whose job is street sweeping, you see their dark green wheelbarrows lined up at corners. But when they accumulate the garbage off the street, it seems that they just dump it in the river or in piles under the roadway overpasses. Some locals wear what look like surgical masks or bandannas tied around their face, so it's not just me. 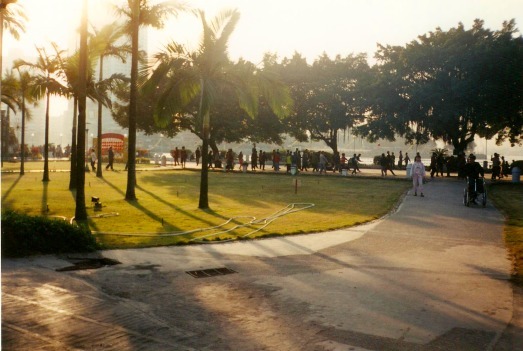 There are quite a few beggars in Guangzhou, although fewer than in Washington, DC. I walked all around Shamian Island on a Sunday morning. There are two large buildings on the island affiliated with the Guangdong Animal By-Products Import-Export Organization. They must move a lot of offal. There are two churches on Shamian Island, what seems like about half the churches in the entire city (there is a larger church, a leftover of French traders, near the city center). Of the two churches on Shamian Island, one is the French Our Lady of Lourdes. It's allegedly a working church, but it wasn't open at all on Sunday morning. 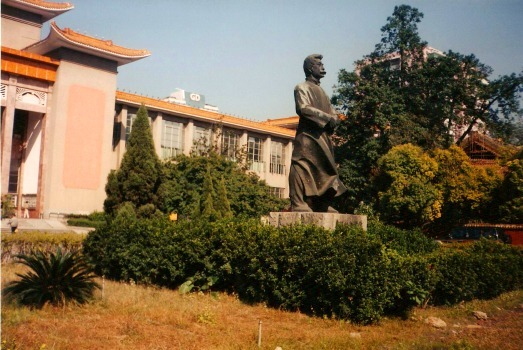 It was probably a Roman Catholic church in the past, and since Roman Catholicism is illegal in the People's Republic of China, even if open it would probably be allied with the puppet "Catholic Church" run by the Chinese Communist Party. China is not quite so oppressively atheistic as it used to be, but that's like saying that Saudi Arabia isn't whipping quite so many women these days to maintain the odious Saudi "public morals". Christ Church, the other church on the island, is almost across the street from the U.S. Consulate. It had a service, looked like about 150 attendees, all that I saw looked like locals. Its location helps it to exist as a token show church. 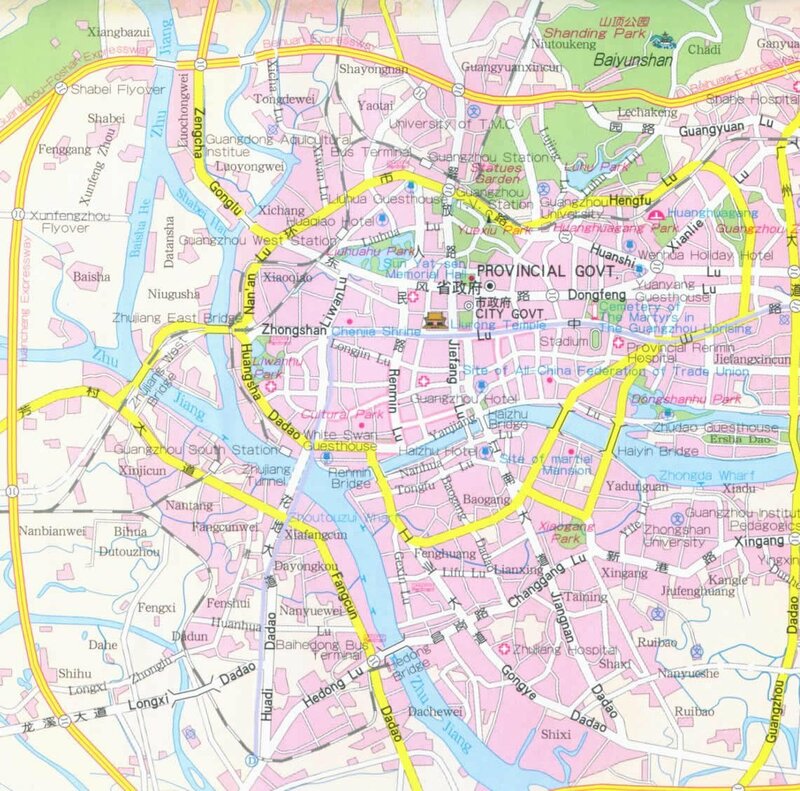 There are maybe five operating Buddhist and Taoist temples of significant size in the city, and a mosque or two. 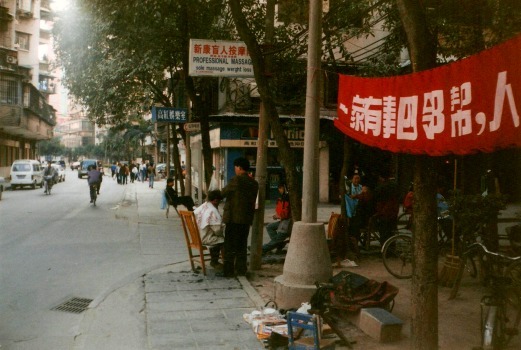 The brutal totalitarianism lives on from the days of Classic Communism, but there is thriving capitalism in China. There are all the coastal factories producing electronics and Wal-Mart goods, plus lots of small-scale businesses. Transport options tend toward the low end. 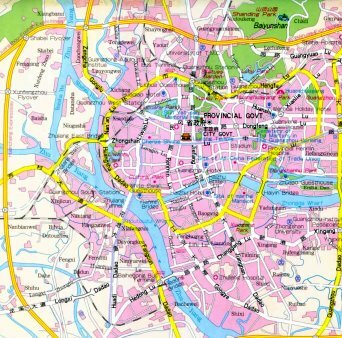 That means lots of motorcycles and scooters, and therefore lots of motorcycle and scooter repair shops. Pious U.S. companies like Hobby Lobby pride themselves on being closed on Sundays and taking cases to the U.S. Supreme Court to keep from giving their employees health benefits that might include contraception. Companies like Wal-Mart aren't so strict, but they still make a big deal about supporting "American values". Notice how many of their products are made in China. Now visit China in December and notice all of the strictly secular "Happy Santa Day!" decorations, and the almost complete suppression of religion. Chinese workers make religious decorations, but they're all shipped to big foreign retailers. The local people can get into big trouble by displaying any religious symbols. The window display of the vacuum tube store. From that odd mix of enthusiastic would-be capitalism and Great March Forward technology comes the shop that sells nothing but vacuum tubes. Yes, I have seen a place in Manhattan selling vacuum tubes to audiophiles, but these are for the repair of simple radios and similar hollow-state home electronics. Vacuum tubes are used in old designs, sturdy and still working, more or less. Replace the tubes and they're good for a few more years. And finally, if you want to get a streetside haircut and massage, they're available. Even with English advertising, oddly enough. A row of motorcycle repair shops.